This is our first installment of Wednesdays with Wheels! He gives a brief description of what you should expect at the Trail Clinic this Sunday, November 3rd! Check back next week to see what he has to say next. Like most runners, the thought of hills probably makes you cringe, right? Well, as it turns out incorporating hills into your weekly routine can actually prevent injury and is safer than solely running on flat ground. It is important to incorporate different types of runs into your routine in order to improve your pace. This means you need to do long runs, slow runs, fartlek runs, tempo runs, and yes, hills. RunnersConnect is a team of expert coaches and fellow runners—according to them running hill sprints is a good way to improve your pace, and make you an all-around more efficient runner by increasing the power and length of your stride. This enables you to cover more ground with each stride using less energy. Hill sprinting enhances neuromuscular fitness, which is the communication between the brain and the muscles. Stride frequency, stride length, and resistance to fatigue all depend on the efficiency of communication between the brain and muscles. Hill sprints generate high leg turnover and enable you to push your body without actually running that fast. In other words, it is very similar to a speed workout on flat ground, but lessens the chance of an injury. I’m sure ‘hill sprints’ sound a little intimidating, but we’re only talking about one to three 8-12 second bursts of fast running. After that, you get to rest for 2-3 minutes to make sure you are fully recovered before starting another one. The hill doesn't have to be super steep either. It just needs to be between a 6 to 10% gradient, that’s only about a 3-6 degree incline. Like most college kids, peer pressure plays a major role in decisions that are made. For me, it was running a marathon my sophomore year. I had joined the UC Running Club where I met ‘crazies’ just like myself—people who enjoyed running. After running with them for a full year, they convinced me to sign up for the Flying Pig Marathon, I was stoked. I enjoyed all of my training and had plans (or hopes) to finish at a 3:30 pace. Everything was fine and dandy, until a week and two days before the race—I signed up to give blood at work (Mistake #1). The next day after giving blood I went out for a run and realized what I had done. I tried to make up for it by eating more, my desperate attempt to erase the stupid decision I had made. I ended up eating too much pasta the night before (Mistake #2) which resulted in my being up half the night throwing up (gross I know, sorry!). The only thing I was able to eat in the morning was half of a banana (Mistake #3). When my friend (training partner) and I arrived downtown, we did not have enough time to use the restroom before the gun went off (Mistake #4). One mile into the race I had to stop at one of the porta-potties and told my friend that I’d catch up (Mistake #5)—I never caught up. For the first 6 miles I was feeling pretty good. I was excited to finally be running in an actual marathon and it was when I saw my family members for the first time with signs cheering for me. I was having a good time..until mile 8. Mile 8 was the beginning of the end. I started feeling my energy levels drain. I found myself looking forward to the Gatorade stops because it meant I could put calories into my body, I didn’t bring any Energy Gels with me (Mistake #3 probably, but we’ll keep it in order, #6). By the half marathon mark I was ready to quit; you should not be feeling as bad as I did at mile 13. I began telling myself that the next time I saw my parents (my dad should probably be considered a pro marathon spectator because they were ALL over the place) I was going to stop and quit. Well, I didn’t see them for quite a few miles and I reminded myself that I had already bought a 26.2 sticker for my car. I told myself that I was closer to finishing a marathon then, than I would have been if I stopped and had to train all over again…it worked, for a few miles anyway. By the time I was at mile 16 I was dead set in stopping, but then I saw my old cross country coach, and since I had never stopped running in front of him before, I wasn’t planning on starting then. The next time I saw my parents I was at mile 19 and I was feeling pretty okay. I yelled out to them “I think I can do it!” and trudged on. At mile 20 or 21 I grabbed a GU they were handing out, unfortunately it was coffee flavored (Mistake #7) and since my stomach was still bothering me I barely got half of it down. By this point, my energy levels were depleted and I was running on empty, my legs were tightening up, I was in pain, and my feet were barely moving. I finally decided I was going to walk. As it turns out my friend Bryce was right—walking hurt WAY worse than running (or what I was considering running anyway). Somehow I made it to mile 25 and that’s where my high school cross country coach’s husband found me. He was helping run people to the end. We chatted for a little while, he asked me how I was doing, I told him I was never going to do it again, he laughed and informed me that most people say that. He left me with .2 miles to go, I miraculously mustered up a smile for the camera at the end and crossed the finish line in 3:43:58. I Wanted To Die. 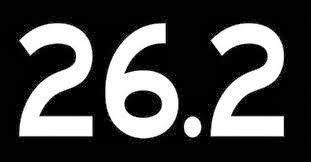 I plan to run another marathon in the spring and hopefully have a much better experience the 2nd time around. Now, I didn’t write this to discourage or scare anyone away from running a marathon. I wrote this in hopes that you all wouldn’t make the same mistakes that I did. Also, if you find yourself feeling like poop on race day, you know that you are not alone. Even with everything that went wrong, I still finished and you can too! Good luck to everyone a marathon on Sunday! When you think of a sport to watch football, basketball, and baseball usually come to mind, right? People typically describe these sports as exciting, intense, and all around entertaining to watch. They have favorite teams or players, fantasy leagues and jerseys--people live for football season. Personally, I think someone needs to create a fantasy league for cross country. Points could be scored by how many people each runner passes, the amount of time dropped from previous races, place (obviously), and total time. 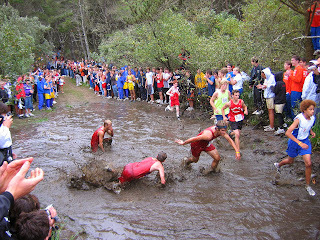 Cross country is just as (or in my biased opinion, more) exciting as any other. For all of you cross country fans out there, you know what I’m talking about. Standing on the sidelines, fans feel the same adrenaline coursing through their bodies, they feel the same excitement and thrill; some can even feel the pain. Fans scream, yell, jump up and down, and dash from location to location along the course…spectators actually squeeze in a workout while they watch without even knowing, you can’t beat that. Cross country is considered a non-contact sport, but in reality, there can be a lot of contact that goes on among runners. It could be anywhere from elbowing to spiking. Runners can trip, get trampled, or fall down a hill in the woods. Anything could happen in a span of 3.1 miles. So for all of you out there who have yet experienced a cross country race, you’re missing out. Find one this weekend, pick a runner to root for (if you don’t already know one), and experience the thrill of the sport.